…all in my eyes”. So yelled Jimi Hendrix and so did we when we saw this wine. (We didn’t “yell” really, rather stated). But it was obviously purple in colour. Obvious also was the white pepper aroma which immediately identified it as made from the Syrah grape. Yet, behind the pepper, was a brambly smell as well as subtle vanilla which suggested contact with oak. The palate was silky with a high acidity and well-defined tannins preventing the acidity from being too cloying after the second mouthful. There was a lovely light sweetness to this wine and, again, the vanilla showed through on the palate but its medium length had a dry finish. 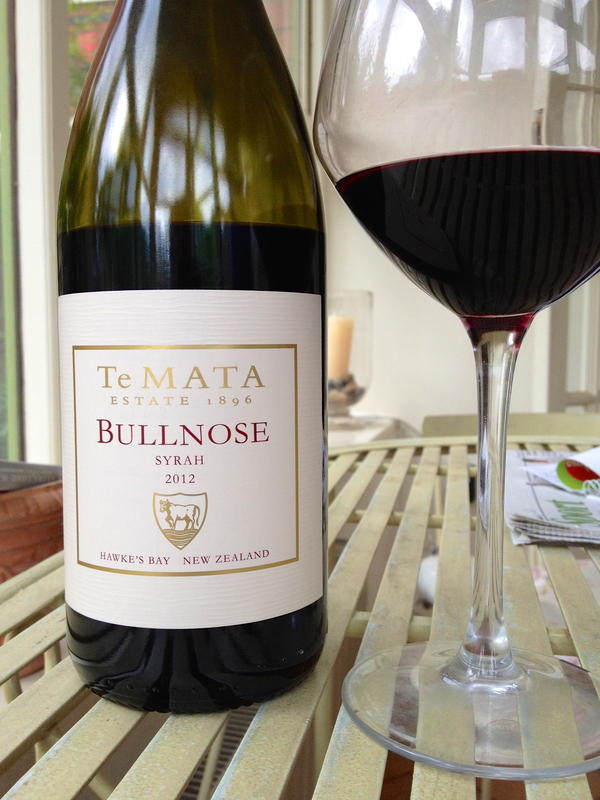 The Hawkes Bay derived Te Mata Bullnose 2012 was a classy wine and had the hallmarks of the New World interpretation of an Old World varietal – forward fruit, accentuated characteristics, light in weight and a heightened acidity. In my opinion, they certainly can outshine much of the lower and mid-price range Old World equivalents and, therefore, represent great value. However, moving up a notch, they lack the subtlety of the more expensive Old World varietals. This was a well-made wine and a pleasure to drink. Cost £25. The creativity of some French wine-makers can be seen in the Vin du Pays classification. The strict prescriptions of Appellation Control wines leave little room for this creativity but the broader, lower classification lets growers express the terroir as they see fit. 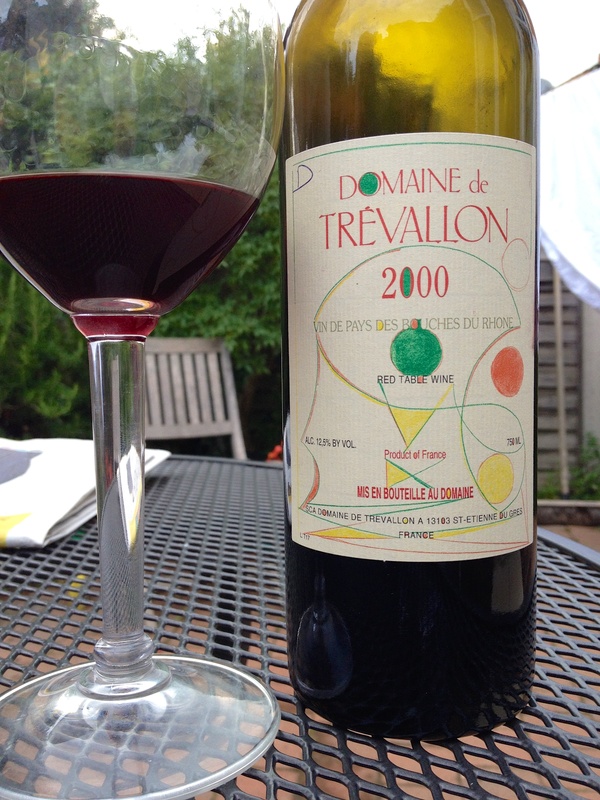 There are 154 such Vin du Pays in France and one of the largest is Bouches du Rhone where Domaine de Trevallon 2000 comes from. This wine, tasted blind, is quite remarkable and, needless to say, is difficult to place because of its individuality. The deep colour made the wine opaque, the only obvious hue being a brown rim showing age. The bouquet was slightly blackcurrant but very subtle allied with some vegetal notes. Despite the obvious ageing, there was a sappy freshness to the aromas. This freshness also came across in the taste which, again, was vaguely blackcurrant as well as gently tannic, giving the wine a pleasing structure. Eminently quaffable, this red wine didn’t need food, its lightness (12.5%) having a refreshing quality. The blackcurrant showed the presence of Cabernet Sauvignon, but not dominantly so, and it’s very difficult to place the other grape variety. This turned out to be Syrah in this 50/50 blend. My knowledge did not allow for the uniqueness of this wine, regarded by Tom Stevenson as “one of the greatest Vin du Pay, producing a quality easily equal to some of the best cru classes of Bordeaux”. Praise indeed – and echoed by Richard and me. ” A wine drinker’s wine”. It’s a strange idiom but one that’s repeated in articles on a variety of subjects, witness the “he’s an actors’ actor”, or “this is a car driver’s car”. I think it’s meant to imply gravity, depth and flatters both the subject and the writer for having some quality ordinary people won’t or can’t enjoy. Anyway, this is our WDW. 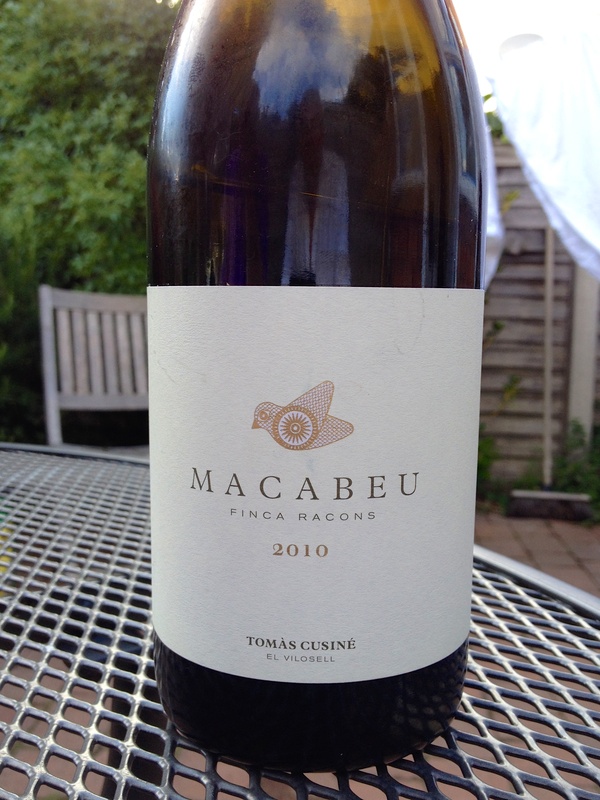 Tomas Cusine Finca Racons 2010 from the Wine Society. It’s been out of stock at the WS for some time but the 2012 has recently been featured in a Spanish offer, the wine we tried, however, is from a previous stock. It’s made solely from the Macabeo grape and is a hefty 14% ABV. The cost of the 2012 is £16.50. The colour is a deep lemon rather than gold and there are some windows to indicate weight. The nose is quite exotic – rich with sweet notes yet having obvious acidity. Cusine suggests opening this an hour before in order for it to develop, it also does not want to be served cold. Immediately, the mouth feel is heavy with slight hardness on the front palate. This is not obtrusive as the wine develops a lovely fruit sweetness in the mid-palate and dries to a long finish. The wine is well-balanced, the relatively high alcohol is worn lightly; it is enjoyable without food but will need to be treated with respect. Food matches could include veal, pork, stronger flavoured fish dishes and tapas of all shades. The two wines featuring here are at the opposite ends of the red wine spectrum and provide interesting contrasts. 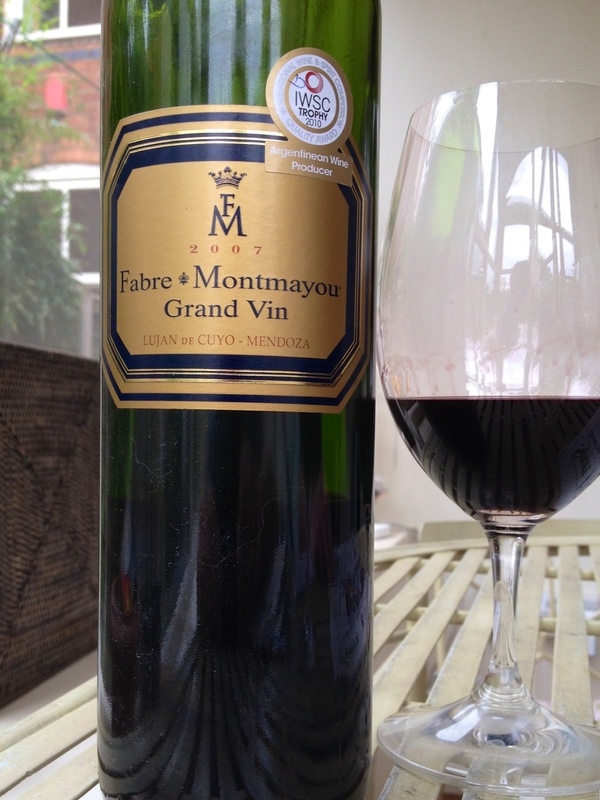 The first is Fabre Montmayou’s ’07 Malbec made in Mendoza, Argentina – at 15% ABV, this is a ‘big’ wine. 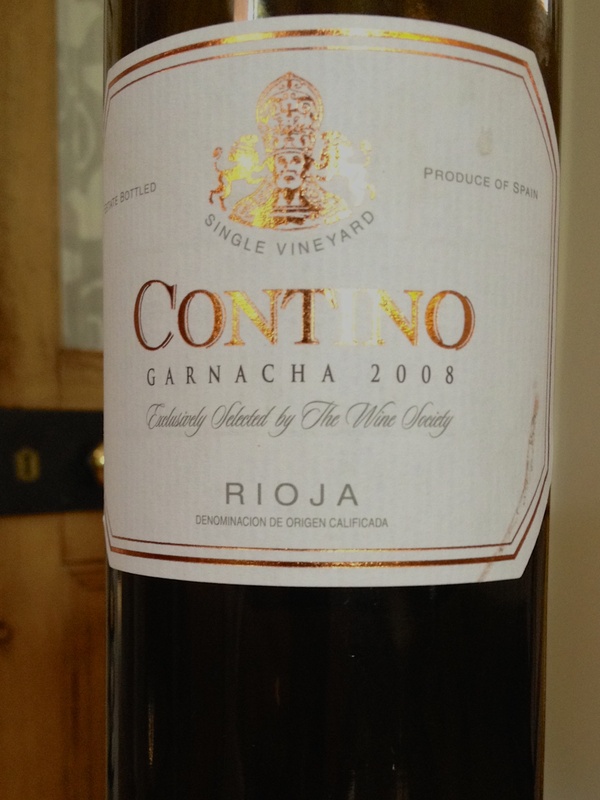 The other wine is a Rioja from the Contino stable, a mono-varietal Garnacha, ’08 vintage at 13.5% ABV. It comes from a relatively small production of 2600 bottles on a 153 acre estate and is unusual in being a single grape variety Rioja. The Malbec’s colour was dense and black with a slight purple rim of youth, with the pronounced windows to be expected from the high alcohol levels. The Garnacha was a clear and bright cherry red, with a slight brown tinge to the rim, indicating some ageing. The nose of the South American wine was all bramble and black fruits, especially prunes, a rich, big bouquet that suggested seriousness. The lighter Riojan nose was sweet with slight vegetal undertones that faded. It had high notes of acidity and possibly some alcohol which Richard detected. The overall taste of the Malbec was savoury with a malty richness and a liquorice hit. It got broader the longer it was opened, the mouth feel being weighty. The Garnacha was a much lighter wine, of medium length, dry but with sweet fruit flavours balanced by a refreshing acidity. Our preference was for the lighter wine (it is summer, after all) but it was interesting to contrast the two styles, each wine showing up the qualities of the other. Blind tasting is good fun; part of that fun is the fool you can make of yourself, not just once – but several times. This Pinot Noir was easily spotted on the nose but then the fun started. It was distinctive enough for me to pronounce either Burgundy or New Zealand – right so far. At that point I stalled. My reasoning. If it’s NZ, it’s generally more forward, more obviously fruity; Burgundy tends to be subtler, somewhat heftier, possibly more reticent, older perhaps? That’s how I benchmark – probably way too simplistic to a more experienced taster. So, colour. Light to medium red, slightly purple (Richard – ‘pale’) at the rim. Some windows. Conclusion – young, some alcohol, about 13%. The nose was sweet with some vegetal qualities, quite forward in fruit, persistent, with some dark notes and a pleasing smokiness. Conclusion – young, forward and immediately appealing – NZ. Okay – palate. Not hugely fruity, quite high acidity, soft, drying, medium length. Can’t decide now. I’m pushed into pronouncing …….’ New Zealand’ and it’s …………. Burgundy. So I declare, in a desire to rectify my error, it must be a southern Burgundy i.e. Cote de Beaune. 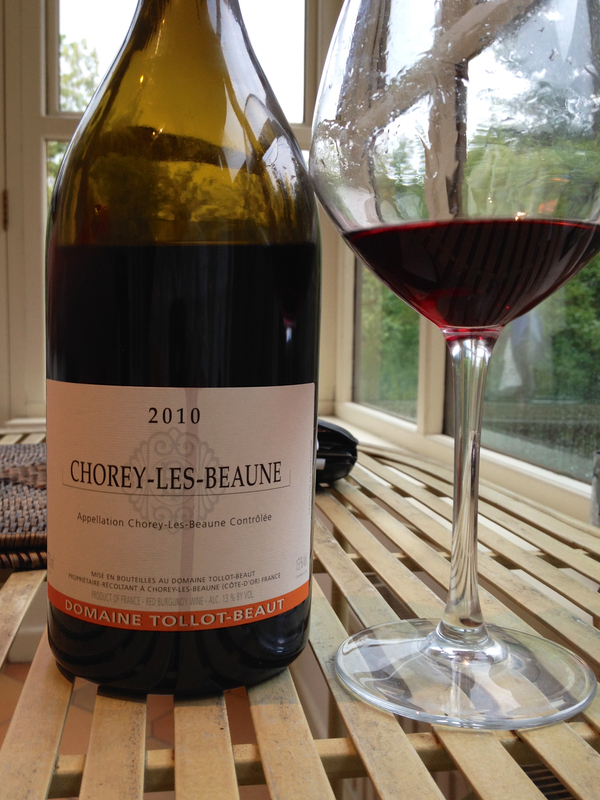 Wine: 2010 Chorey-les-Beaune, Domaine Tollot-Beaut 13% ABV. I did say it would be great with duck. I’m right on that. 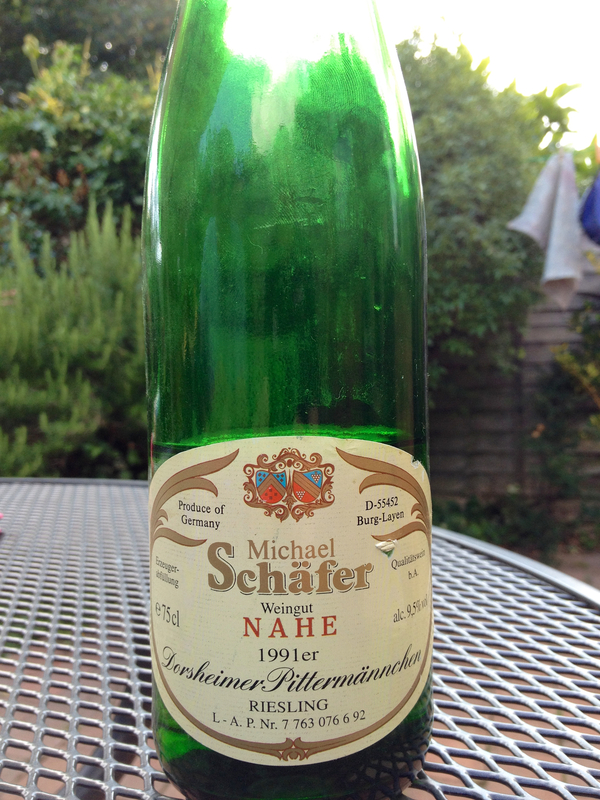 Following the German theme, Richard found a bottle of Nahe wine – Shafer’s Dorsheimer Pittermannchen Riesling 1991 – bought from Majestic several years ago. The ABV was 9.5%. It is reckoned that Nahe (Rhine) wines are most like Moselles in their acidity and delicateness – and so this proved. Deep gold in colour, as would be expected with a 23 years old wine, it exhibited a very mature nose, slightly woody (which vanished quickly) and then the classic petrol bouquet of Riesling while it developed in the glass. The palate was startlingly refreshing in its acidity, belying its age and helping to balance the off-dry flavours. There was sweetness but also strong fruit flavours so difficult to spot in the harmonious whole. A quite remarkable wine, this was tasting well the following night, albeit the palate had a slightly boiled fruit flavour. The cost, Richard thought, was about £6! [Richard: actually £6.49]. Wonderful value. So, two German wines both of which could be enjoyed on a summer’s afternoon without generating the woozy head which higher alcohol wines tend to do. Somebody wrote that German wines, particularly off-dry Rieslings, are ideal for drinking in the summer house on a warm afternoon. That presupposes conditions that are beyond many people, i.e. time and a summer house. Good luck to those who have both. Essentially, it’s no different to sitting looking at a pub car park with a pint of beer and a grab-bag of Walkers. What’s German for ‘a chacun a son gout’? The quality ladder of German wine is predicated on their sugar content – the higher the sugar content the better the wine. On the face of it that is a reasonable rationale because the ripest grapes have the most flavours and complexity to give to the wine – but, when do we drink these, generally sweeter, wines? Most people enjoy wines with food and, apart from the use of the luscious wines at the end of the meal (and that’s not a huge market), which foods readily match the higher quality German wines? Yes, in theory, we can relax in the garden over a glass or two of Spatlese, but, in reality, are there lots of people doing that? 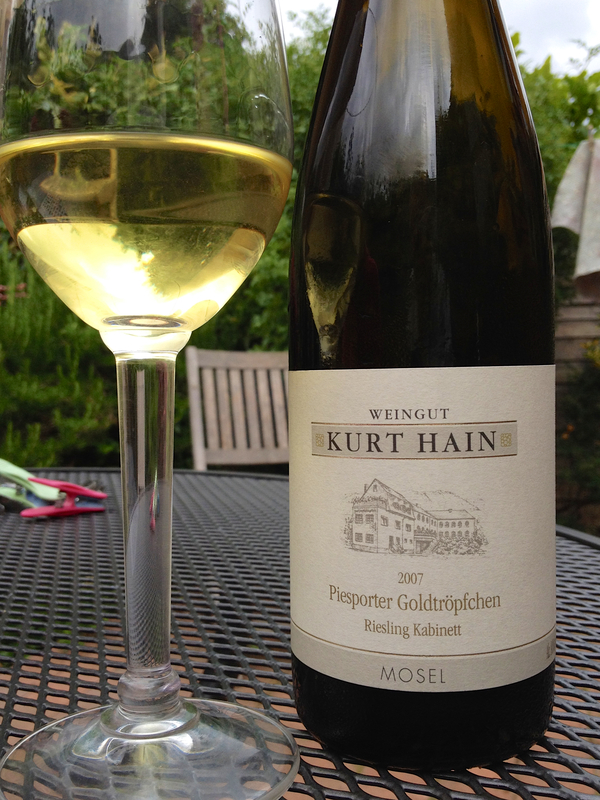 Well, certainly Richard and I enjoyed Kurt Hain’s ’07 Piesporter Goldtropfchen Riesling Kabinett [Richard: in the garden, as it happens]. At 8% ABV, you can mow the lawn, pull up a tree stump or two or re-roof the garden shed afterwards – but we decided not to. It was a lovely drop, right from the strikingly lime green colour to its appley finish. The nose had ‘an Alsace taint’ (Richard) and was only slightly petrolly but very rich with lots of high acidity aromas. It developed quite a honeyed aroma the longer it sat in the glass. The palate exhibited why better quality German wines are so wunderbar. The balance of acidity and sweetness keeps you wanting more – but not in a guzzling way, as each drop needs to be savoured for its smooth-as-silk mouth-feel. The final taste was definitely off-dry but had the attractive apple freshness. What to eat with this? Well light, aromatic cheeses, fish and most poultry (be careful with the sauce) would be wonderful.